Sabine Zenker presents her concept for the treatment of wrinkles and midface volume loss with hyaluronic acid and polycaprolactone. Skin ageing is a continuously and onwardly marching process typically dividable into two mechanisms — extrinsic and intrinsic ageing. Photoaging is the major trigger for skin changes from extrinsic factors1,2. The predominant pathomechanism is the formation of free radicals causing oxidative damage and induction of an inflammatory milieu3 mainly occurring in the dermis. All this results in a decrease in collagen type I and degeneration of extracellular fibres4. Clinically speaking, the skin undergoes atrophy in all layers, becomes thinner5, less elastic, and presents with wrinkles and folds (solar elastosis) as well as irregular pigmentation, broken vessels, and possibly skin cancer and its precursors. Intrinsic skin ageing is a process based on chronobiologic, genetically determined ageing and can be influenced by hormones6,7 as the skin is a typical target organ for hormones — estrogens are responsible for elasticity, water retention, and circulation8–10; androgens increase sebum production; and gestagens inhibit the enzymatic depletion of connective tissue11,12. The drop in hormone levels that occurs during menopause results in a number of skin changes. The thickness of the epidermis decreases through the reduced proliferation activity of the keratinocytes13 and restricted capacity for differentiation14. Throughout the dermis a depletion of up to 30% in collagen fibres occurs in the first 5 years of menopause15. Further to this, skin matrix proteins also decrease in number16, and the skin’s function does wane in terms of sebum and sweat production. Additionally, the skin becomes thinner (as cigarette paper), rough, wrinkly, more sensitive, and more easily vulnerable. Benign lesions such as seborrheic keratosis can occur. 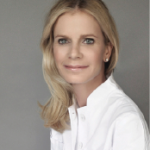 Focussing on the ageing of the facial skin, its implications for aesthetics, wrinkles, and creases in the perioral region distort and alter perceptions in a very prominent way as they are real age giveaways, and they — with the passing of the years — give facial expressions an older-looking and possibly negative aspect. Even though facial ageing starts at the surface of the skin, the ageing process goes far beyond and involves all facial structures, such as the muscles, retaining ligaments, fat pads, and the bony structures. For a youthful and appealing look, the architecture and position of the fat pads is pivotal, but over time the facial fat pads get redistributed, they undergo atrophy and become separated17–22. Further to this, a remarkable bony resorption takes place and doesn’t give the needed structural support18,19,23. All this results in deflation and sagging of the midface in a three-dimensional way22,24. Volume loss: further unwanted changes to facial features, such as the occurrence of shades, furrows, and overall sagging, are the reason patients seek help: to restore facial proportions to get back features they had in the past or to improve anatomical aspects of their face; basically, it’s about giving back a healthy look with natural fullness and soft, smooth transitions as well as erasing unwanted shades. 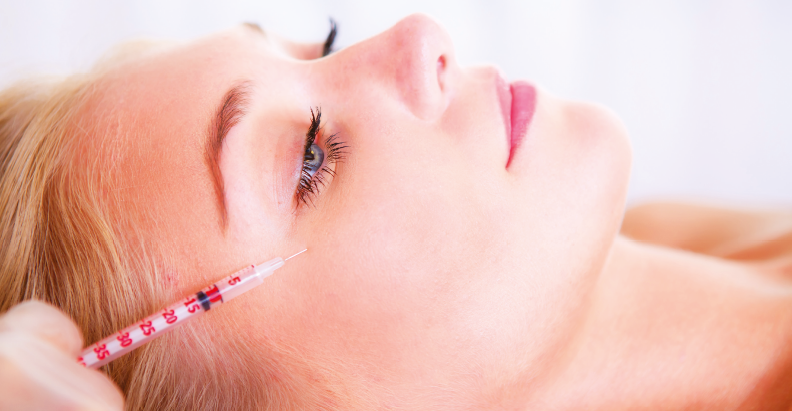 Intradermal retrograde placement (‘blanching’) by serial-puncture or the linear-threading-technique using a sharp needle (30G ½” as well as a 31G 4 and 8 mm) are the common ways to inject filler in facial wrinkles25. 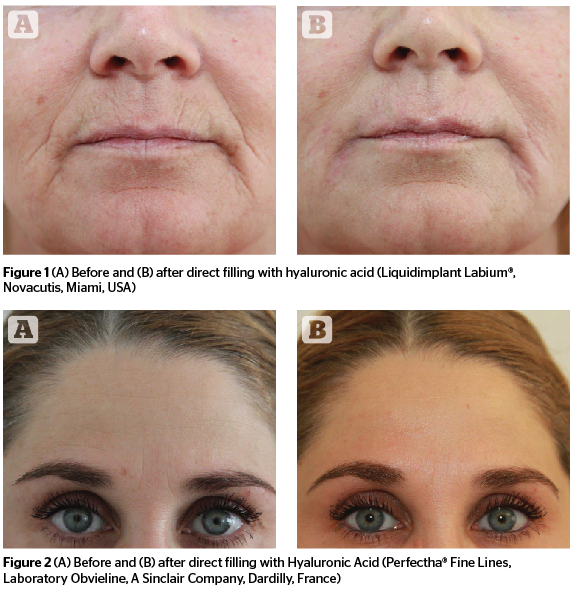 The author does mix the hyaluronic acid with local anaesthetics in a ratio up to 30% (off-label-use), to achieve an optimal integration of the material in the superficial dermis. But each fold shouldn’t be corrected up to the clinical endpoint. For the author, a controlled filling using an injection system is key, as this increases the accuracy of filler placement and does reduce side-effects, such as pain and bruising, which improves the overall aesthetic outcome especially in very superficial injections26. The result of this direct filling technique with hyaluronic acid lasts— depending on material used and individual conditions — for some months. The stimulation technique using polycaprolactone (PCL) is especially suited if an immediate filling is desired as well as a sustainable level of collagen stimulation starting approximately 3 months after injection27-28. Polycaprolactone is a biodegradable filler material consisting of microparticles of PCL suspended in a gel carrier (carboxy-methyl-cellulose (CMC)). The material is placed using a 25G 1½” blunt tipped cannula in the subdermal level, using a fan pattern in a retrograde fashion covering the whole to be treated area; the point of insertion is chosen in a 90° angle in the middle of the fold. The approximate amount of filler injected is 0.1cc. Typical indications for 3D volume loss in the midface are the sunken-in frontal part of the cheek and the sagged lateral portion. 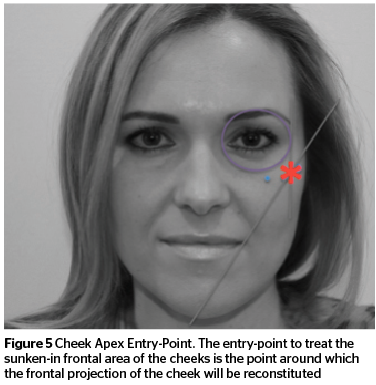 Facial mapping helps to identify the areas to be augmented, the danger zones, and the relevant entry-points, as well as plan the overall injection strategy. 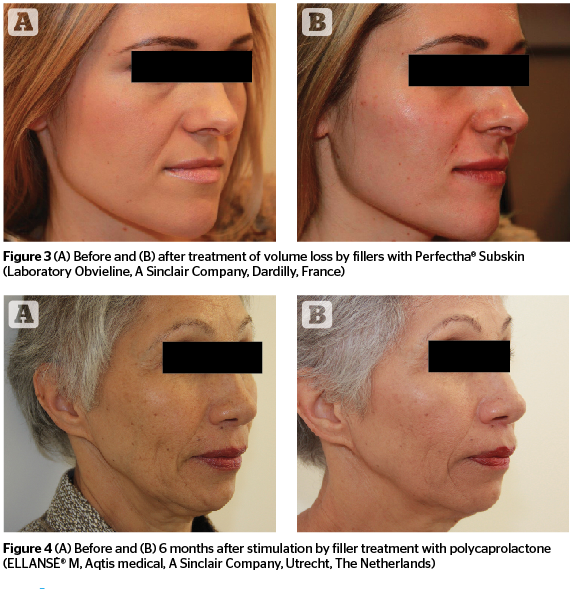 To treat volume loss with filler, typically highly visco-elastic hyaluronic acid fillers with a good volumizing capacity29,30, or calcium hydroxylapatite (CaHA)31,32 for precise shaping, or polycaprolactone for sustained collagen stimulation and volume enhancement, should be used. The use of blunt tipped cannulas results in a more atraumatic31, and quicker treatment procedure, especially when the filler needs to be placed over ‘longer distances’32–37. For the two indications mentioned above, blunt tipped 25G 1½” cannulas are very suited. 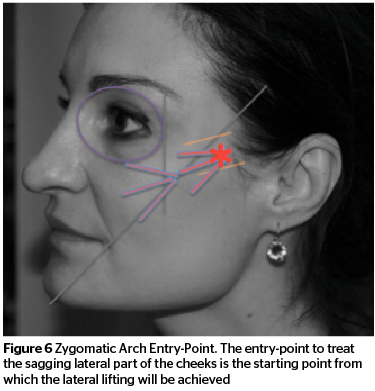 Figures 5–6 illustrate the typical entry points for this treatment concept, the cheek-apex-entry-point and the zygomatic entry-point to treat the upper-part of the midface. The filler material used to showcase the author’s techniques here are the hyaluronic acid Perfectha© Subskin (Laboratory Obvieline, A Sinclair Company, Dardilly, France). As equipment, a blunt tip cannula 25G/38 mm is used (Steriglide®, TSK Laboratory, Oisterwijk, Netherlands). The starting point is the cheek apex entry-point. The filler is injected in a bolus technique (‘gunshot-wise’), in a retrograde fashion and placed supraperiostally; according to the clinical needs, more injections medial and eventually lateral of the first entry-point are performed in a ‘banana-wise’ fashion. The amount of filler per point is approximately 0.1 cc. Augmentation is conducted up to the clinical endpoint. The starting point is the zygomatic arch entry-point. The filler is injected using a fanning technique in a retrograde fashion starting supraperiostally and ending up subdermally on the most lateral part of the injection area. Amount of filler per point is approximately 0.1–0.2 cc. Augmentation is conducted up to the clinical endpoint. Using these two techniques, the frontal projection of the cheeks can be treated and lateral lifting acheived in a customized and individual way. Age related changes, such as wrinkles and volume loss can be easily and individually treated with filler. An indication-specific filler treatment approach shows how versatile fillers are: by applying the appropriate technique, they can be used for specific, delicate indications by precisely and elegantly filling even the smallest lines and wrinkles. Uitto J. Unterstanding premature skin aging. N Engl J Med 337 (1997) 1463–1465. Wlatschek M. Solar UV irradiation and dermal photoaging. J Photochem Photobiol B. 2001 Oct;63(1-3):41-51. Lavker R et al. The Spectral Dependence for UVA-Induced Cumulative Damage in Human Skin. J Investigative Dermatology (1997) 108, 17–21. Ha YR et al. Analysis of facial skin thickness: defining the relative thickness index. Plast Reconstr Surg 2005;115:1769-73. Campbell L et al. Estrogen promotes cutaneous wound healing via estrogen receptor β independent of its antiinflammatory activities. JEM vol. 207 no. 9 1825-1833. Brincat MP: Hormone replacement therapy and the skin. Maturitas 35 (2000) 107–117. Verdier-Sevrain S et al. Estradiol induces proliferation of keratinocytes via a receptor mediated mechanism. FASEB J. 2004 Aug;18(11):1252-4. Brincat MP et al. Estrogens and the skin. Climacteric. 2005 Jun;8(2):110-23. Dunn LB et al. Does estrogen prevent skin aging? Results from the First National Health and Nutrition Examination Survey (NHANES I). Arch Dermatol 1997 Mar;133(3):339-42. Huber J et al. Immunological and dermatological impact of progesterone Gynecol Endocrinol 15. 2001. 18–21. Yaar M et al. Aging versus photoaging: postulated mechanisms and effectors. J Investig Dermatol Symp 1998 Proc 3:47-51. Yaar M et al. (1999) Aging of skin. In: Freedberg IM, Eisen AZ, Wolff K et al., eds. Fitzpatrick’s Dermatology in General Medicine, 5th edn, Vol. 1. New York: McGraw-Hill, 1697-706. Krutmann J et al. Hautalterung: Grundlagen – Prävention – Therapie. Springer Berlin Heidelberg, 2008. Bernstein EF, Uitto J. (1996) The effect of photodamage on dermal extracellular matrix. Clin Dermatol 14(2):143-51. Murphy MR et al. The aging face consultation. In: Master Techniques in Facial Rejuvenation. Elsevier;2006:1-16. Coleman SR et al. The anatomy of the aging face: volume loss and changes in 3-dimensional topography. Aesthet Surg J. 2006;26(suppl 1):S4-S9. Vleggaar D et al. Dermatological implications of skeletal aging: a focus on supraperiosteal volumization for perioral rejuvenation. J Drugs Dermatol. 2008;7:209-220. Donofrio LM. Fat distribution: a morphologic study of the aging face. Dermatol Surg. 2000;26:1107-1112. Zimbler MS et al. Anatomy and pathophysiology of facial aging. Facial Plast Surg Clin North Am. 2001;9:179-187. Rohrich RJ et al. The Fat Compartments of the Face: Anatomy and Clinical Implications for Cosmetic Surgery. Plastic & Reconstructive Surgery 119(7):2219-2227. Pessa JE et al. Cure analysis of the aging orbital aperture. Plast Reconstr Surg 2002;109(2):751-5. Monheit G. et al. Hyaluronic acid fillers. In: Dermatologic Therapy. Volume 19, Issue 3, pages 141–150, May 2006. Glogau R et al. Effect of Injection Techniques on the Rate of Local Adverse Events in Patients. Implanted with Nonanimal Hyaluronic Acid Gel Dermal Fillers. Dermatol Surg 2008 (34): 105-109. Nicolau PJ et al. Neocollagenesis after injection of a polycaprolactone based dermal filler in a rabbit Eur J Aesth Med Dermatol 2013;3(1):19-26. Kim JA et al. Neocollagenesis in human tissue injected with a polycaprolactone-based dermal filler. J Cosmet Laser Ther. 2015 Apr;17(2):99-101. Stocks D et al. J Drugs Dermatol. 2011;10(9):974-980. Radiesse (injectable calcium hydroxylapatite) [prescribing information]. Franksville, WI: Merz Aesthetics, Inc.; October 2011. Gilbert E et al. J Drugs Dermatol. 2012;11(9):1059-1068. Hexsel D et al. Double-blind, randomized, controlled clinical trial to compare safety and efficacy of a metallic cannula with that of a standard needle for soft tissue augmentation of the nasolabial folds. Dermatol Surg 2012 Feb;38(2):207-14. Fulton J et al. Filler injections with the blunt-tip microcannula. Drugs Dermatol. 2012 Sep;11(9):1098-103. DeJoseph LM. Cannulas for facial filler placement. Facial Plast Surg Clin North Am 2012 May;20(2):215-20.